By nature, rabbits choose only certain places to use as their bathroom. These spaces are usually corners of the area where they live. Rabbits are clean animals. They prefer to keep their urine and pellets in one spot, away from where they sleep and eat. Rabbits can be easily litter box trained. Spay or neuter your adult rabbit for easier litter box training and less marking behavior. Rabbits of any age can learn to use a litter box. Many rabbits also love to have hay close by to munch on while using their litter box. You can always add a nice hay rack to keep hay within reach of the litter box or a hay basket. The Litter box(s): Small, medium, large or x large. Size and type of litter box will depend on the size and needs of your rabbit. Quality litter: Use a rabbit safe litter such as Critter Country, Yesterday's News or CareFresh. Hay: Use hay as a light cover over the litter and to place in nearby container or a hay rack. 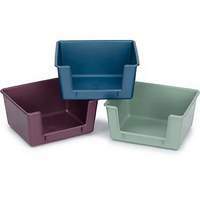 Litter boxes come in an assortment of shapes and sizes. Litter boxes may be high backed, rectangular, oval shaped or custom shaped. The size of the box depends on the size of your rabbit(s) and/or your rabbit's special needs. The options are endless. Basically, use what is safe and functional that meets your rabbits needs. Generally speaking, bigger is better when selecting your rabbit's litter box. Take into account your rabbit's size, any special needs, age, as well as the size of the rabbit's enclosure. Rabbits prefer to munch on some hay while they "do their business", so remember to add hay! Making the litter box an inviting place to be will encourage bunny to use the box as intended. 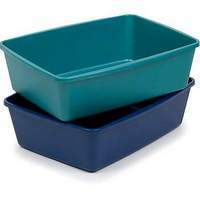 Plastic cat litter boxes: These come in several sizes and colors. 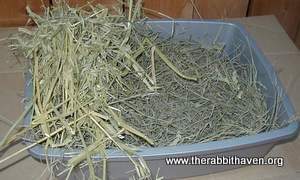 They can be adapted for a rabbit by filling with non-toxic litter, placing a large handful of fresh hay in one end of the box. 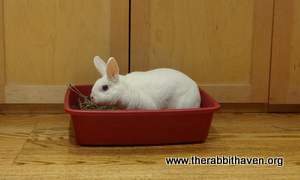 Rabbits tend to enjoy this basic litter box set up and use it with ease. 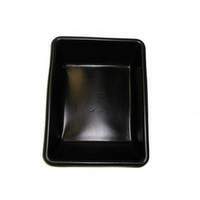 Large bus-boy tubs: Available at Smart & Final or other restaurant supply stores, these large gray trays are hard plastic, easy to clean, and are a roomy size for larger buns or more than one rabbit. High-back corner litter boxes: These litter boxes usually work well for baby bunnies or small breeds. A high backed litter box may also be useful if your bunny pees over the edge of the litter box. The high back prevents this problem. Square hi-back litter box with one low side: Good for rabbits with arthritis or other conditions which make hopping into a box difficult. Note: You can also use a utility knife to cut down one side of a regular cat litter box and cover the rough edges with split clear plastic tubing like you might use to bunny-proof wires. Custom litter boxes: These can be made from a variety of trays or boxes available at local stores. 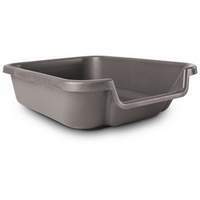 High back/low front entry litter box: This box allows the rabbit easy entry into the litter box. Many rabbits seem to like this type of box. Disabled or older bunnies and very young, small rabbits appreciate this type of box too. We recommend organic litters, made from plant fibers, alfalfa, oat straw or paper. Do not use clumping cat litters for rabbits. Rabbits tend to nibble on everything, and if they ingest clumping litter or clay litter, they risk a potentially deadly intestinal blockage. Also please do not use softwood shavings, like pine or cedar shavings or chips. These products are linked to disease in rabbits. Critter Country: This litter is easy to use, scent free, absorbent and worry free for bunny. Aspen Supreme pellet litter: This pellet litter had a "woodsy" smell. It is absorbent. CareFresh: Paper based light weight litter. Made from paper pulp and dust-free. Compostable. Yesterday's News: This pelleted litter, made from recycled newspaper, is absorbent and compostable. Final litter box set up: Once you have selected your litter box and litter, place an appropriate amount of litter in bottom of litter box, place hay on one end and as a light cover as well. Then the litter box is ready for your rabbit. Create a nice room with plenty of space, the right size litter box, a good quality litter and then place the litter box in a back corner of the enclosure. You will use a few cups of litter and possibly some hay on one corner of the litter box. You need only about 1 inch of litter in your litter box. Introduce the rabbit to the litter box by showing bunny the litter box. Then place the bunny in the litter box and let the rabbit jump in and out. You can encourage the use of the box by picking up any pellets dropped and popping them right into the litter box. If the rabbit goes in the opposite corner, put the litter box there. Place a box in the corner they choose. If the rabbit makes any droppings pick them up and place into the litter box. The rabbit will quickly catch on. Start with a litter box (or two) in the rabbit's house (enclosure). If bunny urinates in a different corner of the enclosure, move the litter box to that corner. Once bunny is using the litter box in the enclosure or cage, open the door and allow it into its running space. You will need one litter box in each room the rabbit plays in. These are called training boxes. Watch the rabbit as they explore their room. If bunny heads to a corner where there's no litter box, or lifts its tail in the characteristic fashion when it needs to urinate, gently move bunny into the litter box quickly. After your rabbit first uses the litter box, offer praise and even a treat. Once bunny uses the box in the room a couple of times, you're well on your way! Talk to your rabbit with a gentle voice saying "Good boy" or "good girl". Positive reinforcement and a gentle voice will encourage your rabbit to repeat the desired behavior. The rabbit will naturally use the litter box once they know where it is. Some rabbits like to kick or dig their litter out of the box. If this occurs, try a taller litter box or you may want to buy a covered litter box. Try experimenting with different litters in case the rabbit is simply objecting to the litter. If need be, you may also purchase a plastic grid to cover the litter in the box. If your rabbit backs up so far in the litter box that its urine goes over the edge, try a high backed litter box or find a larger or taller litter box. That will solve this problem. If your rabbit continually urinates in a spot where there is no litter box, go ahead and move the litter box there, even if it means rearranging the enclosure or some furniture in your living room. Or you could use a larger box and /or add a second litter box. It is much easier to solve the problem rather than to try to work against a determined and sometimes confused bunny. Be creative and patient. As your rabbit becomes well box trained in his enclosure, you may increase the area for the rabbit to play in. Add extra training boxes at this time. The rabbit is very small compared to your home. They need a bathroom in each room. Training boxes are a very good idea. As your rabbit becomes more confident and uses fewer boxes, you can remove some of the early "training" litter boxes. PS: No need to be concerned about random little pellets left about in their room that they may need to mark their space. This is perfectly normal. Eventually, they will not need to mark their space as they will know the space belongs to them. Change your rabbit's litter boxes every other day. Cleaning the litter box is simple. Dump used box contents into your compost bin, then rinse out the litter box. Then use a spray made up of white vinegar and water (50/50 solution). Let this solution stand for few minutes, then clean with hot, soapy water. Rinse well and dry. 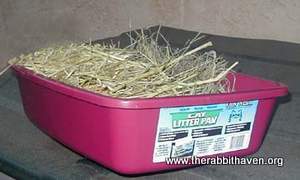 Refill the litter box with litter and place handful of hay in the corner of box. We recommend that you have two litter boxes so that one litter box is always available to your rabbit during changing.